Christmas Courting is an enjoyable story, although I was held up by the name Keturah. It didn't feel like it fit the time period (maybe it is authentic, but uncommon). I felt bad for Keturah as her heart was jerked around, but I liked the happy ending. Two novella books in one week, I'm on a roll! :) I still struggle with novellas, but putting that aside, I did enjoy this book. For the most part, the stories didn't feel too rushed. Probably because in 3 of the 4 stories, the main characters already knew each other. 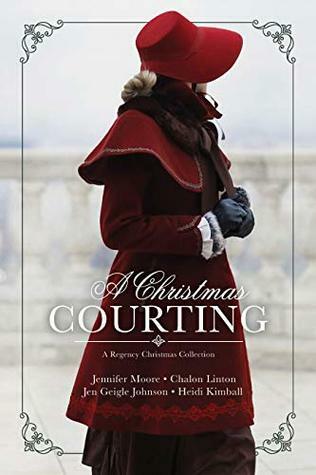 In Love and Joy Come to You, I enjoyed how Cassie was able to slowly break down Lord Covington's defenses and show him what he had been missing after shunning Christmas celebrations since the death of his father and sister. I do wish that there had been a bit more detail on his back story, but I'm kind of nosy that way. I got a bit frustrated with Christopher in A Christmas Courting. If he would have just told Keturah outright what was going on, it would have saved her a lot of pain and him quite a bit of frustration. Even though the reader can guess right away what will happen, this is a sweet story. Mistletoe Memories was the most difficult for me to get in to. The author kept alluding to what had happened to Alice, but it was done in such a way that I felt lost through most of the story, like I was missing a very important piece of the puzzle and everyone else knew where it was but they weren't telling me. I would have preferred it if the author would have told the reader what the issue was near the beginning of the story instead of making it such a mystery. My favorite story was probably Second-Chance Christmas, although at the beginning, I kind of wanted to throttle Francie for her complete cluelessness at how Gerard must be feeling. I love Christmas stories. It doesn't matter the time of year that I read them. In fact, my favorite time to read Christmas stories is probably in the summer. I don't know why. I'm just weird like that, but I was really excited to read this compilation. My two favorite stories were Love and Joy Come to You, which was just a sweet story of healing and love, and Second-Chance Christmas. I like when people finally realize their feelings for each other. I also enjoyed A Christmas Courting. I felt bad for Keturah, but I actually thought the leading guy was pretty fun. I struggled with Mistletoe Memories. It was well written, and didn't seem like a short story, but the whole time I felt like I needed more backstory. I felt like I should have read something else before this to give me insight to what was going on. There was a feeling of familiarity, but I was super frustrated because I wasn't sure if it was supposed to feel that way. I also wish that Patrick would have stood up for Alice during one of her difficult times. Anyway, it has a beautiful cover, and it's a great compilation of Christmas stories.